Hands down the best jackets I own are from Evereve. Chic, statement layering pieces that work dressed up or casual. 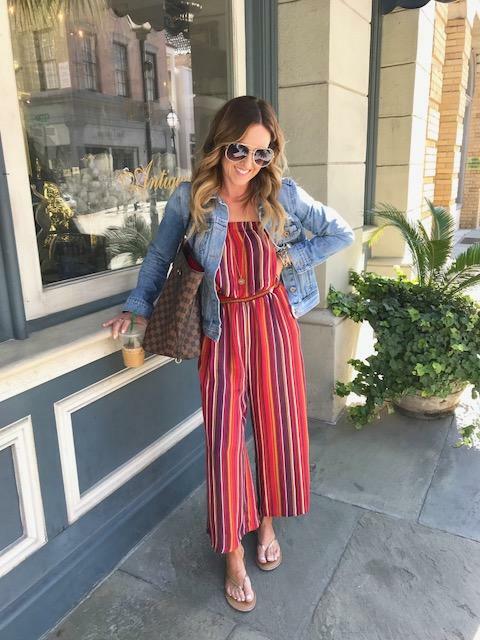 One of my absolute favorite items to wear all Spring and Summer are jumpsuits! I got one from Evereve last Summer and was instantly hooked! Since then, I've created quite the collection. Styled casually for a day of running errands or dressed up with heels, most jumpsuits are so versatile! Being only 5'3", I'm sharing my tips/tricks for finding jumpsuits that work for shorter frames. Be sure to scroll down to the bottom of the post to see my top favorite jumpsuits with Evereve. You know what's better than a sale? A sale on items that are new and this Season!! Everything at Evereve is on sale!! New arrivals, name brands like 7 For All Mankind, BlankNYC and more. I've got the shoes - now I'm ready for Spring! I'm so excited to be teaming up with Aerosoles to share my favorites from their Spring collection. I'm all for easy, slip on and go shoes. As soon as I saw these slip on espadrilles, I knew they would be perfect! Be sure to check out all their new arrivals as they are having a sale BOGO 35% off!